Note to audiences: this production contains adult themes and subject matter, profanity, and simulated violence, and is intended for mature audiences only. 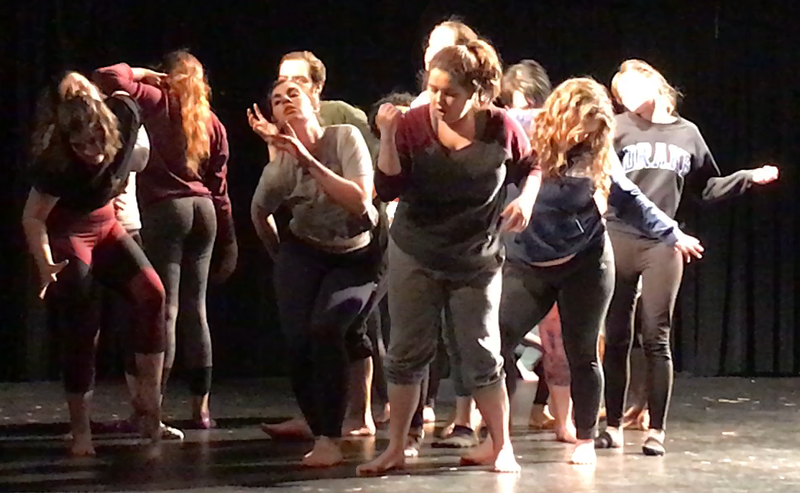 The cast of “The Trojan Women” rehearses an ash walk, an exercise from the Japanese movement form called butoh. This spring, Drake University Theatre dives into a darkly-poignant adaptation of The Trojan Women by Euripedes, adapted by Charles Mee and directed by Mirla Criste. The Trojan Women runs Thursday, April 5 through Sunday, April 8 in the Performing Arts Hall of the Harmon Fine Arts Center. Performances will start at 7:30 p.m. Thursday through Saturday, and 2 p.m. on Sunday. Admission is $10 for adults and $8 for students and senior citizens. Tickets are available online, in person, or via telephone at the Fine Arts Box Office, 2525 Carpenter Ave., 515-271-3841. Drake Theatre Arts’ production of The Trojan Women begins with Charles Mee’s adaptation of Euripides’ devastating tragedy and ends as a cautionary tale that lays bare the zeitgeist of today’s America. Infused with music and movement from the heart and instincts of characters trapped in an all-too-possible nightmare, Drake’s production, like its ancient Greek predecessor, asks us all to confront a darkness that threatens to overwhelm the world sooner than we think. Trojan Women is Criste’s directing debut at Drake University; she joined the Drake faculty in fall 2017 as assistant professor of theatre arts. The cast explores taking on these controversial topics through a Japanese movement style called Butoh. This movement technique allows the cast a more in-depth exploration of their characters, according to senior BFA musical theatre major Maddie McKeown. “It has been a very collaborative process for the chorus women—using the movement form of Butoh as the basis for our movement and exploring what is going under the surface with the trauma these women have faced using this technique,” McKeown said. Criste hopes this production leaves the audience thinking about the world and the human condition.